Delivering bad news is never a comfortable situation, but some are more at ease with it than others. While some people might deliver bad news easily, it doesn’t always come out in a way that is all that comforting to others. 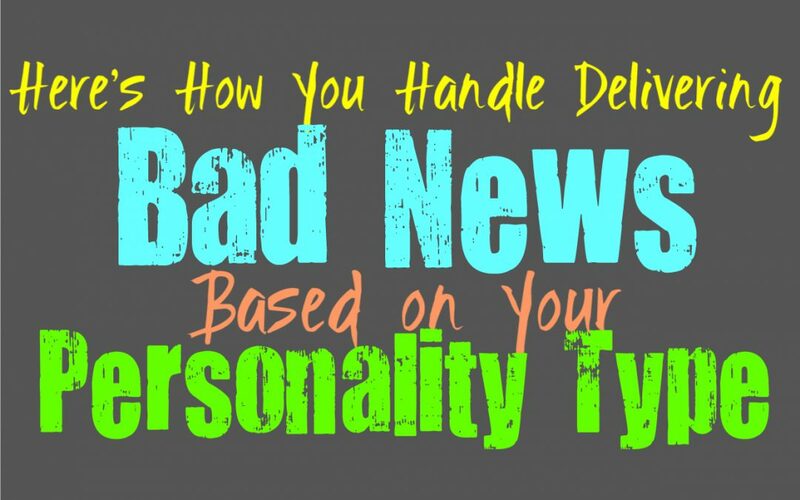 Here is how you handle delivering bad news, based on your personality type. INFJs don’t enjoy having to deliver bad news, especially to someone they care for. Having to be the messengers of anything upsetting or negative, is definitely going to bother the INFJ. They want to make people happy and dislike having to bring them down in any way. While they don’t enjoy delivering bad news, they do their best to comfort others and make sure they deliver the news kindly. INFJs are sensitive to others and they don’t want to hurt anyone, so they are very compassionate when they are giving less than desirable news. ENFJs don’t enjoy having to be the one delivering bad news, but they are naturally tactful people. When they have to tell someone something that is upsetting, they will do their best to be sensitive and compassionate. ENFJs often know how to spin things in a more positive manner, in order to help others cope with whatever the bad news is. They don’t like brining people down and want to do their best to make their loved ones happy. ENFJs will hate delivering bad news, but they will do it in a very sensitive and considerate manner. INFPs really don’t like having to deliver bad news, and can struggle with this. They will do their best to be sensitive with their deliver, but depending on how severe it is they might become emotional themselves. They simply don’t like being the one to stir things up, or cause someone else to become upset. INFPs try to deliver the news in a way that isn’t too harsh, and will want to be supportive and considerate of whoever is receiving the news. ENFPs definitely don’t like having to deliver bad news to others, since they don’t enjoy discord. ENFPs don’t want to deal with confrontation and often attempt to avoid this entirely. When they are forced to be the one giving the bad news they can sometimes try to spin it in a more positive light. They might even struggle to get it out entirely, wanting to find a way to make it go away without having to pay attention to the bad news itself. ENFPs just don’t want to make things worse for people and really hate confrontation. INTJs might not mind giving bad news, but sometimes they can struggle with their delivery. INTJs are very direct and to the point, which can be upsetting for people receiving any sort of bad news. Sometimes when the INTJ has to give someone this upsetting news, they will give it in a very factual and precise manner. They simply aren’t sensitive to the emotions of others, and don’t do this to be upsetting or seem rude. INTJs don’t necessarily have much tact when it comes to protecting the feelings of others, instead they want to be upfront and honest. ENTJs don’t necessarily mind delivering bad news, but sometimes they can be a bit harsh. They value being sincere and factual, and this can often be a bit upsetting to others. ENTJs aren’t always great at being tactful and so this can often make them appear a bit blunt when delivering bad news. They don’t like upsetting people, they simply don’t naturally understand how to navigate the emotions of others and so they aren’t always the best people to receive bad news from. INTPs don’t really enjoy having to deliver bad news and can actually struggle with it. They don’t like upsetting people, but at the same time they don’t find it easy to understand the emotions of others. While the INTP will not want to be upsetting, they struggle when it comes to finding the right way to be sensitive to the emotions of those around them. Their delivery is likely to be accurate and precise in a way that can come across as harsh. ENTPs don’t really like delivering bad news, but they will do their best to make it easier for others. They might use humor as a way to lighten the mood, but this can be off-putting to some. The ENTPs intentions are simply to help make the situation a bit easier, but some people don’t respond well to their brand of humor in these situations. ENTPs do care about others, they just aren’t great at expressing their emotions in a way that others can fully appreciate. ISTJs don’t really like having to deliver bad news, but they do whatever they must to take care of their responsibilities. If there is something the ISTJ needs to tell someone, they will take the time to deliver this news, even if it is bad. While they don’t enjoy upsetting others, ISTJs aren’t really sensitive to emotions. Sometimes they can seem a bit harsh or overly direct when they are sharing the bad news, since they just try to be factual. ESTJs take care of their responsibilities, whether they are easy or a bit challenging. While they might not like having to deliver bad news, they will do their best to get the job done. ESTJs will certainly deliver the bad news, but they might be a bit too direct with this. They are accurate people who strive to be sincere and as efficient as possible. They might share this news in a manner that is factual, but lacks a bit of tact and might come off as upsetting. ISFJs really don’t like delivering bad news to people, especially the ones they care for most. They will live up to their responsibilities and deliver the news if they must, but they certainly won’t enjoy it. ISFJs don’t want to upset others and so they often do whatever they can to make things easier on people. They will try to deliver the news in a way that is sensitive and considerate, and will often try to show a sense of compassion towards the person they are sharing it with. ESFJs don’t like delivering bad news at all, especially since they dislike upsetting others. They try to create harmony and joy in their environment and delivering negative news can only hurt this. ESFJs will do their best to deliver the news in a compassionate manner, trying to be as positive as possible. They often want to make things easier for others, and so they will often try to help them solve whatever problems might be arising from this negative news. ISTPs don’t really like delivering bad news, and can often try to avoid this task entirely. Having to be the one to dish out the bad news can feel daunting and a bit draining. When the ISTP has no choice but to give the bad news, they can deliver it in a manner that seems a bit harsh. They simply focus on facts and will often give this information as sincere and upfront as they possibly can. ESTPs try to be sensitive to others, but sometimes their delivery with bad news can be a bit harsh. They simply want to rip the Band-Aid off, so they can be overly direct with their expressions. The ESTPs will likely say things in a very factual and upfront manner, which can be upsetting to people who are receiving truly negative news from them. ISFPs really hate delivering bad news and will often try to put a positive spin on things. They don’t want to upset others and try to make everything in life light and happy. When the ISFP has to deliver upsetting news they might try to look on the bright side, expressing how things will get better. They try their best to be supportive and don’t want to make things any harder for the person receiving this negative news. ESFPs really don’t like delivering bad news, and they might even try to avoid it for a while. They often try to make life happy and positive, and will struggle when it comes to anything that brings down the mood. ESFPs who have to deliver bad news can sometimes try to put a positive spin on things, finding a way to see the bright side of the struggles. If the ESFP is not being overly positive, they might be emotional themselves, connecting to the upsetting information in a way that can be a bit expressive.